This is a quick, fresh stir-fry that we have loved forever, it seems. A great way to use the fresh asparagus that is getting seasonally less expensive all the time. If you have never used vegetarian "oyster sauce", this is a great place to start. If you can't find it (and I give you an online source at the end of the stir-fry recipe), I have posted a homemade sauce recipe below. For the "beef" in this recipe, I used Soy Curls®, strips similar to TVP but made with the whole soybean. They are very tender. I usually use them for a chicken sub, but I decided to try them as a beef sub, and they worked really well. They are much less expensive than commercial vegetarian meatless strips, though you can use those if you wish. 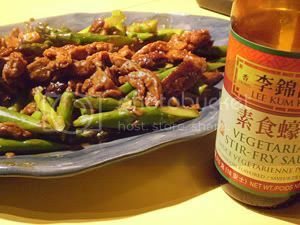 BRYANNA'S CHINESE-STYLE VEGAN "BEEF" AND ASPARAGUS STIR-FRY WITH VEGETARIAN "OYSTER SAUCE"
This recipe is different from the one in my Chinese cookbook, "Authentic Chinese Cuisine for the Contemporary Kitchen". Serve immediately with brown basmati rice. 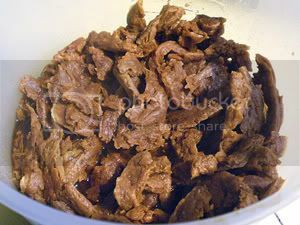 Combine the sesame oil, sherry, ginger, garlic and cornstarch with the "beefy strips" in a non-metallic bowl. Set aside. Heat a heavy skillet or stir-fry pan over high heat, add the 1/2 Tbs oil and swirl to coat. Add the "beef strips". Stir-fry until browned. Add the asparagus and 2 Tbs water. Cover and cook over high heat until the water evaporates, but don't let it stick. Stir. Add 2 Tbs more water, cover and let evaporate. Toss the mixture each time before adding water. You may have to do this 1 or 2 more times. Stop cooking when the asparagus is crisp-tender. Pour the broth mixed with the "oyster sauce" into the pan, bring to the boil and boil rapidly for 1-2 mins. or until the sauce is slightly reduced, and the mixture is heated through and coated in the sauce. Nutrition (per serving): 254.0 calories; 24% calories from fat; 6.6g total fat; 0.0mg cholesterol; 650.9mg sodium; 787.2mg potassium; 14.5g carbohydrates; 7.8g fiber; 3.1g sugar; 6.6g net carbs; 31.9g protein; 4.8 points. Vegan "Beefy Strips" can be 2 1/2 pckgs. Yves Veggie "Beef Tenders", 2 pckgs. Lightlife Smart Menu "Beef Strips", 2 pckgs. Morningstar Farms Meal Starters "Steak Strips", or 1 2/3 pckgs. Presidents Choice Meatless "Beef Strips". OR, you can use Soy Curls®. Soy Curls® are made from the whole soybean. Though they are dry, keep them (double-bagged) in the freezer to keep them fresh. 4 cups boiling water, 4 tsp. Marmite (or other yeast extract paste), 4 Tbs. + 1 tsp soy sauce, 4 Tbs + 1 tsp ketchup, and 4 tsp gravy browner. Drain the Soy Curls® when they are tender, and use in the recipe. Lee Kum Kee Vegetarian Stir-fry Sauce (a mushroom-based Chinese vegetarian oyster sauce substitute) is widely available and worth stocking up on this sauce (it's very inexpensive) when you are in a large city that has Asian stores, if it isn't available in your area. I use it frequently to coat plain extra-firm tofu for use in stir-fries and fried dishes instead of chicken, and, of course, it's essential in some Chinese dishes. As well, it can add rich flavor to homemade seitan and other dishes. Another good brand I have found is Woh Hup Shiitake Mushroom Vegetarian Oyster Flavoured Sauce. Blend all the ingredients EXCEPT the dissolved cornstarch in a blender (leave the plastic thing out of the center hole in the blender lid and cover with a folded towel, so that the hot liquid doesn't explode) until as smooth as possible. Pour into in a medium saucepan and heat to boiling over high heat. Add the dissolved cornstarch and stir until thickened. Cool and store in a covered jar or bottle in the refrigerator. Since it is quite salty and sweet, it should keep for several months. NOTE: You can, alternately, microwave the mixture, with the cornstarch, in a medium bowl and cook on HIGH for 1 minute, then whisk. Repeat until thickened. NOTE ON DRIED MUSHROOMS: For the dried mushrooms, you don't need expensive shiitakes-just use the inexpensive dried Chinese mushrooms that are easily available (sometimes called "dried Chinese Forest mushrooms" or just "dried Chinese black mushrooms") in most supermarkets and Asian groceries. Snap off the stems and discard them, then grind the mushrooms to a powder in a DRY blender or coffee/spice grinder (well-cleaned). But you can use dried shiitake mushrooms. NOTE ON CHINESE BROWN BEAN PASTE: This is a very common Chinese ingredient and should be available wherever Chinese foods are sold. It is also known as "brown bean sauce", "yellow bean paste or sauce', "soybean condiment", "Yuan Shai Shih" or "Mo Yuen Shih". If, however, you can't find it, substitute a mild brown miso (can be chickpea miso or even adzuki bean miso), mixed with a bit of water to make a softer mixture, sort of halfway between a sauce and a paste. Nutrition (per 0z. ): 38.6 calories; 7% calories from fat; 0.4g total fat; 0.0mg cholesterol; 415.8mg sodium; 52.8mg potassium; 8.2g carbohydrates; 0.4g fiber; 5.8g sugar; 7.8g net carbs; 1.1g protein; 0.7 points. 1 oz. is about 2 T.
Dump the mix into a bowl and cut in the cold vegan butter with two forks, or a pastry cutter until the mixture is like crumbs. Mix together the lemon juice and milk. Pour into the mix and mix briefly with a fork. Place the dough on a lightly-floured piece of cooking parchment and fold one side over the other, then repeat. Roll out to about 1/2" thick. Cut with a biscuit cutter. You can re-roll the scraps, but handle them gently so they don't get tough. Place on a baking sheet. Bake 12 minutes. Serve hot. Nutrition (per biscuit): 132.3 calories; 38% calories from fat; 5.7g total fat; 0.0mg cholesterol; 178.4mg sodium; 135.8mg potassium; 17.6g carbohydrates; 2.2g fiber; 1.5g sugar; 15.4g net carbs; 3.3g protein; 2.7 points. Use about 3/4 cup lquid in total and drop spoonfuls close together in a nonstick baking pan. For the gravy, I usually make a vegan "milk gravy" with some kind of vegan "chicken" or "sausage" in it. I had, for some reason, picked up a box of Bisto Traditional Gravy Mix last time I shopped. It's made for use with poultry and meat gravies, but the actual mix is vegan. It's a British product, but we have it here in Canada in most supermarkets. I was in a hurry, so I decided to try it with the biscuits, and it worked out very well! 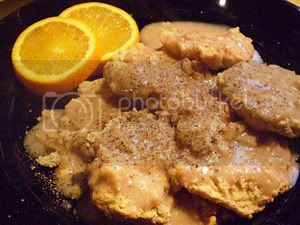 I have never used a gravy mix before! There are other brands with better ingredients, perhaps that would work in this recipe, but you might have to tinker with the amount of mix and you probably won't need to use the vegan broth powder. Also good on toast! NOTE: I used Soy Curl "crumbs" in this-- the little pieces at the bottom of the bag. Just soaked them in hot vegan chicken-style broth and drained them. Mix the milk, Bisto, sesame oil, broth powder together with a whisk. Pour into a small skillet or medium saucepan and whisk constantly over high heat until it thickens and boils. Remove from heat and stir in the chicken substitute. Serve hot over split biscuits. Nutrition (per serving): 98.8 calories; 29% calories from fat; 3.3g total fat; 0.0mg cholesterol; 625.1mg sodium; 263.8mg potassium; 10.6g carbohydrates; 0.7g fiber; 4.7g sugar; 9.9g net carbs; 8.1g protein; 2.1 points. 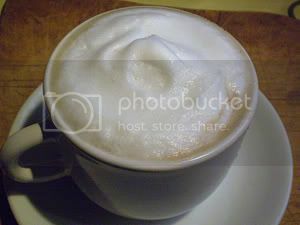 I tried a cappuccino with Almond Breeze-- the foam is nice, but the coffee is creamier with soymilk. 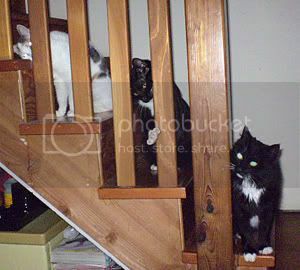 "Our gang", Sinéad, Ringo, and Tina waiting on the stairs like they do every morning, for us to come up and feed them! VEGAN TRUFFLES FOR YOUR SWEETIE ON VALENTINE'S DAY! UPDATE: HAPPY VALENTINE'S DAY 2011! At this new post, I've posted 2 new vegan truffle recipes, with variations, that do not contain margarine or vegan butter-- one is nut butter-based, and one contains silken tofu. You gotta have chocolate on Valentine's Day, right? Well, we certainly do! As I've mentioned before, though, I'm not much of a candy maker. 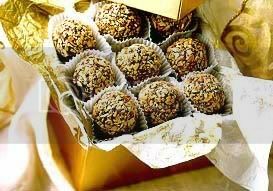 But, I discovered some years ago that truffles are actually not very hard to make, and make an impressive gift for your sweetheart! Believe me, if I can do it, you can do it! Why are chocolate truffles called truffles, anyway? These candies, based on ganache (which is generally chocolate mixed with cream to make a smooth mixture, but in this case, liqueur and vegan butter are used instead of cream), resemble the French mushroom-like fungus of the same name. 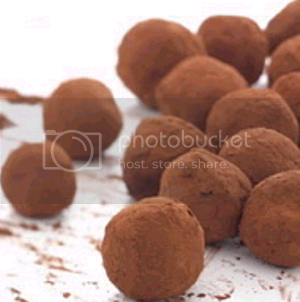 And, like the original truffle, chocolate truffles also denote luxury and a sumptuous taste experience. Cocoa Camino (organic, fair trade) has chocolate chips that are vegan. I use Vivani dark chocolate, or Denman Island dark chocolate, but there are others. Dagoba has a wide range for baking. Newman's Own has some vegan bars, all organic, fair trade. Check out some of the online vegan stores I mentioned above for other brands of vegan, organic chocolate and chocolate chips. There are more every year! Ah!Laska, Fairly Traded cocoa, Now Foods Organic Cocoa Powder, Green and Black's ( a UK brand, but available in North America), Organic Dutched and Natural Cocoa. Break up the chocolate in very small pieces. Place in the top of a double boiler over barely simmering water. Cook until chocolate melts, stirring often. Transfer to a medium-sized bowl. With an electric mixer, beat in the Earth Balance. Gradually beat in the liqueur, beating constantly to keep the mixture creamy and smooth. Cover and refrigerate 1-2 hours, til firm. With hands, roll mixture into 1" balls. Roll balls in cocoa mixture or nuts, shaking off excess. You can place them in little candy cups, if you like-- gold foil ones are nice. Equally divide between two pint freezer bags with zip-lock tops. Remove excess air and seal. Can Freeze up to 6 months. Nutrition (per truffle, rolled in cocoa/sugar mixture): 109.2 calories; 44% calories from fat; 6.2g total fat; 0.0mg cholesterol; 21.8mg sodium; 65.5mg potassium; 12.4g carbohydrates; 0.3g fiber; 1.3g sugar; 12.1g net carbs; 0.8g protein; 2.6 points. Use orange liqueur instead of coffee liqueur and add grated zest of 1 orange. Roll in chopped nuts. Hazelnuts are nice. RASPBERRY ALMOND TRUFFLES: Use raspberry-flavored liqueur (or syrup), and chopped or slivered lightly-toasted almonds for the coating. 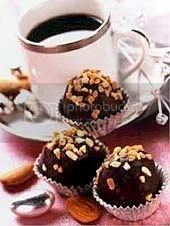 COFFEE OR ESPRESSO TRUFFLES: Use Kahlua or other coffee-flavored liqueur (or syrup) and any nut of your choice. Well, I guess it was inevitable that I get one of those boxes of goodies from Lightlife to try out and report on on this blog. (I am going to be totally candid about my reactions, BTW!) I have tried some of the Lightlife products, but they are no longer available in my area. After trying some of the products, I am going to ask my HFS to get some of them back! which I was afraid might be kind of dull, like many vegan "sausage" brands. It's low in fat, has a great texture, and actually a very nice flavor. If you want it spicier, the great thing is that you can squeeze it out of the tube into a bowl and knead in some spices and/or herbs, then form it easily into patties. Otherwise, just slice it like I did, with a sharp serrated knife. I cooked the patties in a nonstick skillet with a small amount of Chinese (dark) sesame oil for a smokier flavor. With hashbrowns, browned onions and apples, whole wheat sourdough toast, and tofu scramble, and accompanied by one of my husband's great soy cappuccinos (made with my homemade soymilk! ), it was a great meal! Previous to that breakfast, we'd tried the Organic Smoky Tempeh "Fakin' Bacon" Strips with a similar meal. I was not sure how DH would receive these because he doesn't really like tempeh, but, surprise, surprise, he really liked them! They don't get really crispy unless you use alot of oil (and I cooked them in just a little dark Chinese sesame oil in a nonstick skillet, as I did with the sausage patties), but we still liked them. Very nice flavor. On Friday, my husband tried the Smart Chili for lunch, and saved me some to taste later. It was surprisingly spicy (pleasantly so-- I thought it would be under-spiced), hearty, and low in fat, but a little on the sweet side. But it would make a good quick meal if you are really on the go. Today for lunch, we tried the Smart Strips Chick'n Strips. I wasn't as enthusiastic about these. I thought they were too salty, and a bit on the thick side. I rinsed them and drained them, but they were still pretty salty. However, they were pretty good in a "chicken" taco, cooked in my homemade Red Chile Paste (see below) (you could use your favorite taco seasoning). I used commercial taco shells, Tofu Sour Creme, grated vegan cheeze, commercial tomato salsa, and shredded Savoy cabbage (didn't have any lettuce). They were quite tasty! From my book "Soyfoods Cooking for a Positive Menopause". Store in the refrigerator indefinitely in a covered jar. Mix each Tablespoon of paste with about 1/4 cup of water. This would be enough for one package of the strips. Saute or steam-fry a small minced onion. Add whatever you are using for filling ( crumbled firm frozen tofu, veggie hamburger, veggie strips, etc.) and the dissolved paste and stir around until it is absorbed. It's pretty spicy! I've suggested some other products you can use in the following recipe instead of the product above, including "beefy" home-flavored Soy Curls (see directions below the recipe in Cooking Tip #2). Whatever you use, I think you'll enjoy this recipe! This is indeed ridiculously fast and easy, but very good! Serve with steamed rice, brown preferably, bulgur or quinoa. PS: If you prefer not to use "beefy" strips of any kind, try using strips of grilled portabello mushrooms, but add them at the last minute. Combine the strips with the garlic granules, black pepper to taste, dark soy sauce and "fish sauce". Heat oil in a large heavy skillet or stir-fry pan, cast iron, carbon steel or hard-anodized . When hot, add the strips, crushed garlic, and the marinade. Stir-fry until the strips start to brown. Add the tomatoes, green onions, and water and stir-fry just until the tomatoes soften. Taste to see if it needs more pepper, and/or "fish sauce". Nutrition (per serving): 250.9 calories; 35% calories from fat; 10.3g total fat; 0.0mg cholesterol; 1100.6mg sodium; 930.6mg potassium; 10.3g carbohydrates; 1.5g fiber; 4.1g sugar; 8.8g net carbs; 32.7g protein; 5.6 points. Cooking Tip #1: Vietnamese Vegetarian "Fish Sauce": I buy this at my local Chinese grocer. Bragg's Liquid Aminos (which I don't care for as a sub for soy sauce, BTW) are weaker-tasting than soy sauce and remind me of this sauce, so use it instead if you can't find this, or a lite (low-sodium) soy sauce. Cooking Tip #2: To make "beefy" Soy Curls-- use 5.3 oz. 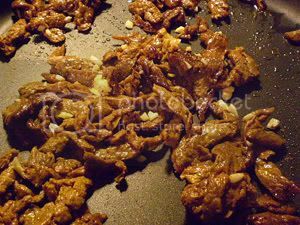 (a scant 4 cups) dry Soy Curls® reconstituted for about 15 minutes with a mixture of: 4 cups boiling water, 4 tsp. Marmite yeast extract, 4 Tbs. + 1 tsp soy sauce, 4 Tbs + 1 tsp ketchup, and 4 tsp gravy browner. Drain the Soy Curls® when they are tender, and use in the recipe. Freeze whatever you don't use. 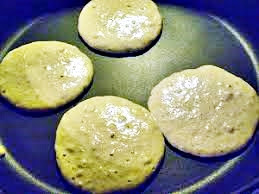 I devised this mix a couple of years ago for my [now defunct] subscriber newsletter, The Vegan Feast, and I wanted a healthful vegan mix that produced a light, fluffy, white pancake (it's full of whole grains, but it looks white!). I also wanted it to have very few additions, so that it was really quick and easy. 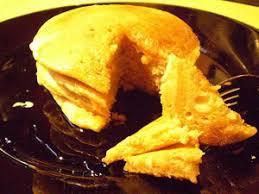 You only have to add water and a little lemon juice to this mix, and it produces pancakes you can be proud to serve to children, picky eaters, omnis, anybody! These can be mixed up in a minute and taste almost like the white kind, but have plenty of fiber and grains in them! I looked at the labels of pancake mixes and found that many of them contain rice flour and corn flour, so I added them (whole grain, though, of course!) and found they did improve the finished product! NOTE: To make the mix with ALL wholegrain flour, the only change you have to make is to use 3 cups whole wheat pastry flour (white whole wheat pastry flour would be good!) plus 1 cup oat flour (rolled oats ground in a DRY blender or coffee/spice mill) in place of the 2 cups unbleached white flour and 2 cups wholewheat pastry flour in the mix recipe. The rest of the recipe is the same. Ideally, mix the ingredients together in a dry food processor . If you don't have one, whisk the dry ingredients together well in a bowl, then rub in the oil with your fingers. Keep in a tight jar, refrigerated, unless you use it up fast. STIR BEFORE MEASURING OUT. Place mix in a medium bowl. Dump the lemon juice and water into the dry ingredients and whisk briefly just until no dry flour is visible-- it will be lumpy and quite thick. Let stand while you heat up your pancake griddle or skillet-- seasoned cast iron or carbon steel is good. Drops of water should sizzle when sprinkled on the surface of the pan if it's hot enough. Turn the heat down to medium. Spoon heaping tablespoonfuls of the batter onto the hot, oiled griddle and spread it out gently to a 3" circle with the back of the spoon. (I used a tiny ladle that holds 1 1/2 Tbs. batter and that's perfect. If you want larger pancakes, use a ladle that hold 3 Tbs. 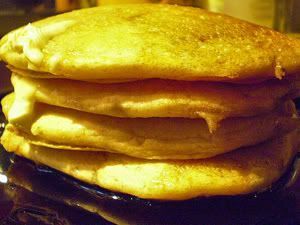 batter; the yield will be about 9 pancakes.) Cook until it has puffed a bit, bubbles appear in the surface and the bottoms are golden-brown. Carefully loosen with a spatula (if using a silicone spatula, make sure that it has a nice thin edge on it) and turn over gently. The center will rise a bit and be firm, and the other side golden when done. Don't overcook, or they fall and are heavy. Serve on warm plates with vegan butter (optional) and warm syrup (we like real maple syrup), or a low-sugar jam or fruit sauce-- whatever is your fancy! Yum! Nutrition (per serving): 270.2 calories; 24% calories from fat; 7.5g total fat; 0.0mg cholesterol; 370.8mg sodium; 293.4mg potassium; 44.8g carbohydrates; 5.6g fiber; 2.6g sugar; 39.2g net carbs; 7.6g protein; 5.2 points. 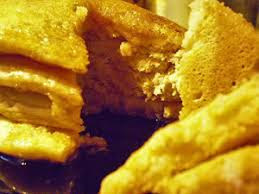 **CORN FLOUR: As a thickener, corn flour creates a pale yellow "buttery" or "eggy" color in the finished product that is much more appetizing than turmeric (which tends to have a greenish cast and, therefore, looks phony). It also contributes a "buttery" flavor or even an "eggy" flavor. It blends to a creamy smooth texture after it's cooked in liquid and then blended with more liquid. Adding a tiny bit of vegan butter gives it an even more buttery taste with very few calories in the finished product, but, in most cases it is not even necessary. You can create soy-free vegan sauces and spreads, if that is a concern to you, and smooth, creamy products without the expense of silken tofu. Corn flour mixtures cook well in the microwave. Corn flour is not the same as cornstarch (confusingly, what we call "cornstarch" in North America is referred to as "corn flour" in the UK)- it's very finely-ground yellow cornmeal. 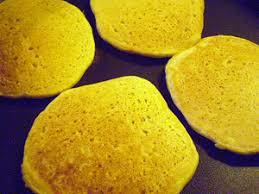 Nor is it the same as "masa harina", the corn flour used for making tortillas, which is treated with lime. It is available in the Asian or Indian section of many large supermarkets supermarkets (SaveOn and SuperStore here in BC, Canada), but also look for it in Indian markets and health food stores, which have organic brands. Basically, use half again as much corn flour as cornstarch, if converting a recipe. NOTE: IF YOU CAN'T FIND CORN FLOUR, if you prefer to use organic products and can't find the organic kind, grind the finest yellow cornmeal you can find in a clean coffee/spice mill until it is powdery (this is important), or grind yellow cornmeal on the finest setting of your electric grain mill (I had to run it through mine twice).